First off, a language lesson. The closest city to our campus is Kurtköy, which means “Wolf village.” The o has a sideways colon over it (ö if your computer reads Turkish), so you should purse your lips and push your tongue forward when you say it. To pronounce Kurtköy correctly, then, first say Kurt, then pretend you’re kissing someone (maybe considering a French kiss), and say the last part as though it rhymes with BOY. Enough of that. Suffice it to say that Turkish isn’t all that easy. As I stepped under the high-strung tarps of the market street, I was first drawn to a display of fresh strawberries. They were early berries, quite expensive, maybe about 6 or 7 lira/kilo. Not too bad, I guess. 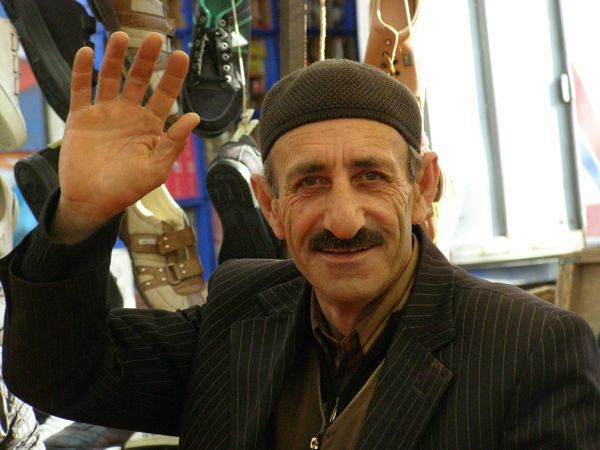 As I was considering, the vendor smiled and handed me a çilek. Sweet, firm, and red through the middle. DELICIOUS! I was in his power. 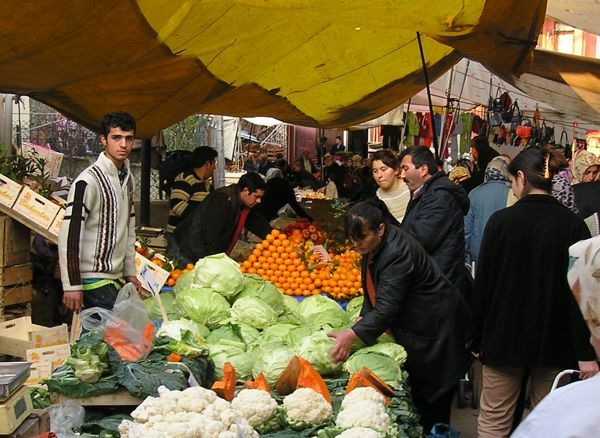 I bought a half kilo of berries and added two pomegranates; my total bill was a whopping 6 lira (about $4). Then off to the veggies. 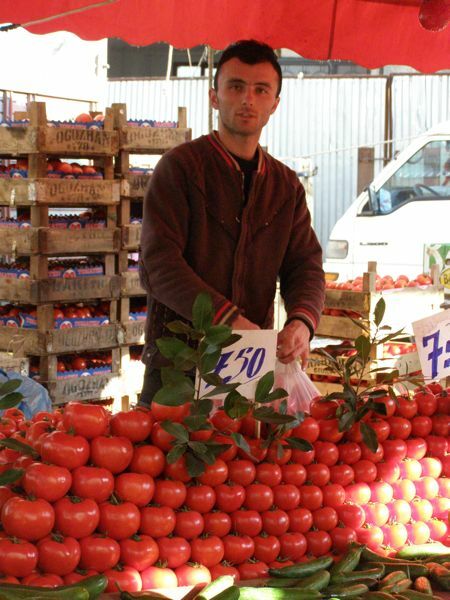 I bought a half-kilo each of carrots (6) and tomatoes (9) for another 4 lira ($2.50). A careful shopper squeezes the cabbages. A few spices, some Turkish string cheese (better than any you’ve tasted), and six sheets of yufka (a thin phyllo-like pastry) cost me another 4 ytl. I was over my limit. Ah, well. Amazingly, the Turkish words I thought I’d forgotten came back as I needed them. Whew! A Friday shopper pays a lira for her bananas. Many of the shoppers pull little two-wheeled carts, much like a nylon wastebasket on wheels, and occasionally someone rolls by in a wheelchair. 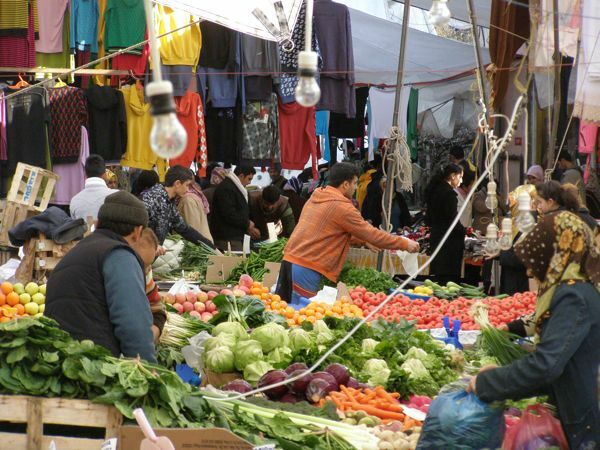 The street market is by far the cheapest way to buy produce, sundries, clothing, linens, and even shoes; many Turks can only afford to shop on market day. We teachers go because it offers the most delicious produce, and we just plain love being there. Maybe lots of people feel that way. 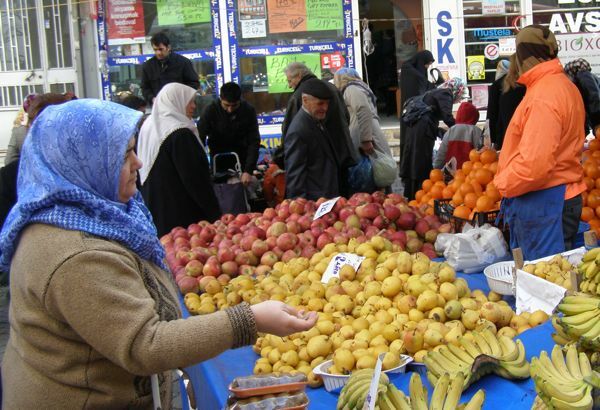 Many of the vendors stopped their barking to welcome me (an obvious yabanci—foreigner) to the market, and others invited me to snap their pictures. Could it be my permagrin? Who knows? It’s just all great fun. And for goodness sake, the SUN was out! Of COURSE I’ll take your photo, boys!